This is the closest house in town to the Turoa ski fields. Behind is the Tongariro National Park so you have space and adventure right at your doorstep. The wraparound deck overlooks a large section and next to it is the private spa. You are a one-minute walk to the Junction, the Powderhorn Chateau and the train station. 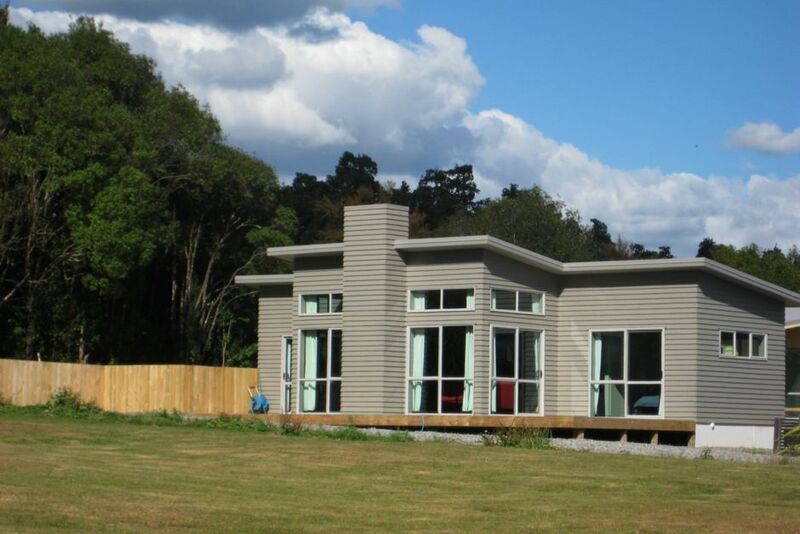 This is a well-designed modern chalet, with two bedrooms either side of an open plan kitchen and living area. Bedrooms both have queen beds and bedside tables; linen and cleaning are included in the price. Beds will be made up and ready for your arrival. The rooms also include an oil heater and an electric blanket each, as well as black-out curtains. The living area has a large modular couch that can be moved to suit your requirements and a 42" plasma television. The couch can be pushed together to allow for an extra two people to stay, which will incur an additional charge of $20pp for each night. (You will need to provide extra linen if you take up this option.) Otherwise the linen for the two beds, the bathroom towels and spa towels are there for four guests. These will be washed by the cleaner, who will also take care of cleaning up on your departure. Four bar stools allow for entertaining on the kitchen island opposite the galley kitchen. The kitchen has a large gas cooktop and is fully set up for all your cooking needs. The bathroom has a shower and toilet. The laundry/drying room includes a ventilator and heater to dry your ski or mountain biking gear, as well as a washing machine and dryer. It has a separate access so you can come straight in and remove your wet items. Unlimited wifi. Arrival time is 2pm and the departure is 11am to ensure the cleaner has time to get it ready for the next guests. *Please note that Google maps has the numbering wrong on Railway Row - it is located at what is currently labelled number 3 on the map. This chalet is ideally suited to four guests. Please note there is an additional charge for extras; we will do our best to accommodate for your needs. As we turn people away once a booking is made please note there is a cancelation policy. If you cancel or alter your booking inside a two week period of your stay there will be no refund, unless a replacement booking can be found. Please treat our family getaway respectfully. Just around the corner from the Powderhorn, Railway Station and Junction. Closest house to the Turoa skifield. Nice place, warm and cozy with everything we needed. Would definitely stay again. Great well presented and very tidy house. Perfect for our little get away and spa was great after a day up the mountain. Would definitely stay again. Cosy and comfortable, well equiped chalet. Perfect location to shops, Mt and walking tracks next door. We had such a great stay!!! Lovely to stay at this place again, had a lovely spa, fabulous location. Great house for a winter getaway. Great house for a winter getaway. It is nicely set up for a small family and great for a toddler. The gas fire heats the whole house quickly. The lounge suite is massive and cosy. The bedrooms are a good size and the beds are comfy. We look forward to staying again! We really enjoyed our stay at the Bach. We really enjoyed our stay at the Bach. Fantastic loation and very clean and tidy. Will definitely use again.